Let’s face it – publishers release a lot of games, and it’s almost impossible to play them all when they first drop. With summer (not to mention a new console generation) just around the corner, now’s the perfect time to dive into our backlogs and wrap up some games we’ve let fall by the wayside. Thus, we present Backlog Quest, in which we revisit the games we’ve left unfinished and consider whether they were worth revisiting (or even playing in the first place). What’s it about? 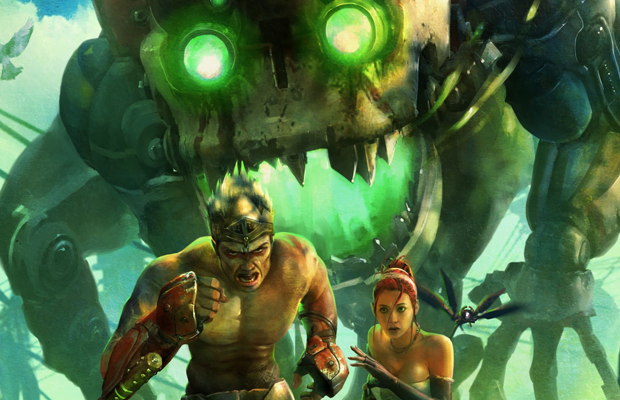 Enslaved: Odyssey to the West was Ninja Theory’s first multiplatform title and based on the story of Journey to the West. It was a Chinese tale that’s been adapted into many mediums such as books and tv shows. You play as Monkey, enslaved to a slaver named Trip, and must find her way back to her homeland on a post-apocalyptic Earth. Why’d you want to play it in the first place? It’s been a game that I’ve wanted to play since it came out in 2010. Back then, it flew under my radar since I didn’t care for Heavenly Sword (although some people said it was a pretty good God of War clone). I couldn’t really risk spending $60 back then on the title. Some months later, it kept getting cheaper and then, harder to find. But a couple weeks ago, I managed to find one sole copy for $10. It was all-alone, amongst a sea of unsold copies of Otomedius and Disney’s Cars 2. It was time to give it a good home. Was it worth coming back to? For the short experience, I’d say it’s good for what you can get for it now. The game is around 5-7 hours long, pretty standard for an action game. The story, while simple, does move in a nicely paced way, even if some levels feel a bit too long. The art and presentation in the game is superbly gorgeous. This isn’t one of those drab apocalypses that makes everything gritty and brown. Enslaved thrives with colour. Characters incredibly detailed, from the scars all over Monkey, to the hilarious facial hair on Pigsy. Visually, Ninja Theory knocked it out of the park. The combat was not bad but there’s something left to be desired when you play around with the systems. I found myself just pressing X & Y repeatedly with no real strategy beyond “press block or evade every once in a while”. Combat became incredibly boring throughout the later levels. The climbing was fine if only for a means of moving the action. It’s not as fluid as more modern games but being a three-year old title, it’s certainly aged in the combat department. That being said, they’ve certainly learned their lessons from this year’s DmC: Devil May Cry. The combat there is fast and frenetic, while Enslaved’s is more slow and not as acrobatic or filled with crazy jumps. Is Enslaved worth $10? Definitely. Namco Bandai were stupid to put this out at $60 originally, as it seemed destined to be that game you say “I’ll buy it later,” or a new IP that’d be better at maybe $40. If you can find a copy, why not give it a chance? It’s probably at your local supermarket right now.